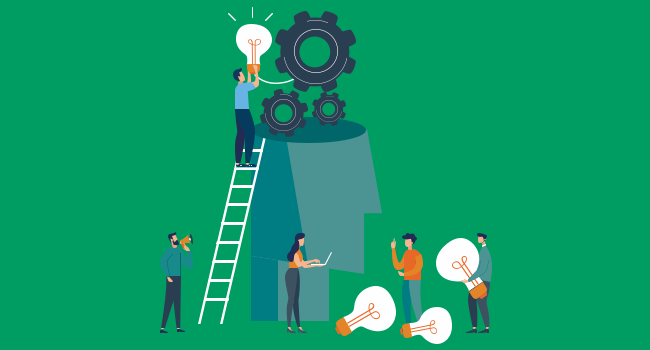 With the goal of increasing business agility and user satisfaction, organisations are incorporating more employee self-service (ESS) and self-help technologies into business operations and have reaped tremendous benefits. HDI’s 2018 Practices & Salary Report shows that “14% of support organisations saw a decrease in ticket volume over the past year” and attributed self-help as the number one factor. 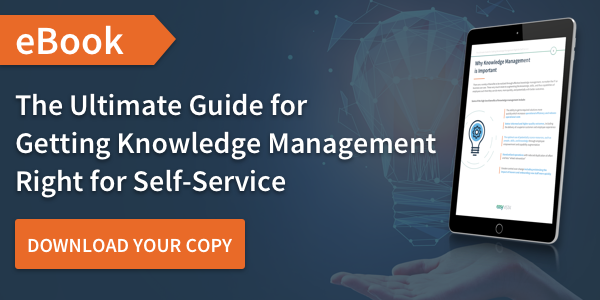 Discover 7 tips for getting knowledge management right for self-service. However, even though the implementation of ESS technologies is increasing, organisations still struggle to get employees to use them, especially when they are not being integrated with self-help technologies. In order to deliver better knowledge with these tools, you should start by understanding why users are not using them in the first place. In the next sections we will explain some of the challenges of knowledge base software usage, including knowledge being irrelevant, hard to find and even hard to understand. We will also outline how ESS paired with self-help technologies can reshape the way you deliver knowledge and get employees to actually use these tools. Make it more contextual. Users want to solve problems quickly so if they get overwhelmed with information that is not relevant to them, they are more likely to step away from the knowledge base and try to reach out to the help desk directly. But there are many ways to make knowledge more searchable and relevant to the user. By integrating knowledge into existing chatbot technology through your self-help tool, for example, users can interact with it in a more conversational way. Chatbots use natural processing language (NPL) which helps them interpret what users are looking for and identify the right knowledge to deliver while improving the search results. There are also ways to enable knowledge to become more pervasive, that is, when relevant content finds the user instead. For example, a user that needs to understand the right steps of a business process can be led to directly access the information from the internal system with the integration of a self-help application. This allows external updates to the information without having to go into the application each time. Focus on the overall experience of the users and not just the knowledge articles themselves. Let’s start with the example of a user looking for information on how to place a video call. Traditionally, users would search for what they are looking for, and most likely be directed to a lengthy knowledge article. The knowledge article may contain all sorts of information, including topics that are not of interest to the user or written in a simple way. This can be overwhelming and reduces the chances of the users finding the solutions. Using a self-help tool can help create information that users can easily interact with, such as guiding the user to the solution rather than throwing it all at them at once. Through ESS and self-help technologies you can also provide rich interactive multimedia content, such as­­ embedding video guides directly into the knowledge procedure. This is an essential part of what we call intelligent knowledge flows, which are an automated way to transfer and deliver knowledge, much like interactive decision trees. Intelligent knowledge flows help service desk agents streamline user interactions. For example, traditionally, if a user calls the IT service desk due to an email issue, the service desk agent would have a detailed diagnostic overview with every possible way they could tackle the issue. This could lead to inconsistent and unpredictable results. Intelligent knowledge flows can help the technicians narrow down solutions by using a programmatic approach. This would not only be advantageous when onboarding new technicians in order to maintain process consistency , but additionally, many operations could be completed by level 1 support instead of escalating (resulting in reduced costs and shift left). Offer interactive knowledge that fits the user’s needs­–it’s all in how you deliver knowledge. While traditional, long-format knowledge articles are a way to deliver information, they might not be effective in guiding people to the answers they need. ESS and self-help tools with functions that allow your users to interact with each other or IT agents and technicians can also encourage them to provide feedback to content creators and subject matter experts. This will help the knowledge management creators to tailor the content as needed. Knowledge managers can also benefit from specific analytics on users, including where people are spending their time and how, or what types of searches need to be improved. Leveraging this information can help reduce the knowledge gaps between the users and the creators. Managing and maintaining knowledge and knowledge quality can be a challenge. An ESS platform integrated with self-help can allow for quick and easy content modification and can integrate with other applications to import your existing knowledge flow so it will be instantly available. Also, managers can delegate authority of specific types of content to specific subject matter experts to take some of the weight from the site managers or developers. This ensures users always have the most complete and relevant knowledge available, according to their unique role. The HDI 2018 Practices & Salary Report states that “61% of support organisations saw an increase in ticket volume over the last year”­­, compared to 55% on 2017. Don’t be one of those organisations. Integrating your ESS with self-help technologies will encourage employees to use them more, increasing productivity and reducing costs. We’re proud to announce that ISL Online has been listed as a leading product in the latest PC Pro review of remote support software, earning 5 out of 5 starts and receiving the “ITPro Editor’s Choice” badge. From all the team at Bellridge we would like to thank you for your continued support throughout the year - we greatly value your business. We extend our warmest wishes for a Merry Christmas and a happy, healthy & prosperous New Year!